Heat ghee on a medium level in a pan till hot. Add grated carrots and mix well. Fry the carrots for about ten minutes or till they are cooked. Mix milk, sugar and condensed milk (can also replaced with khoya). Add to carrots and keep on low heat uncovered for about 7 to 10 minutes, stirring periodically. Dot with fresh cream. Sprinkle cardamom powder and chopped nuts(almonds and raisins). Keep on low heat for about 2 minutes. 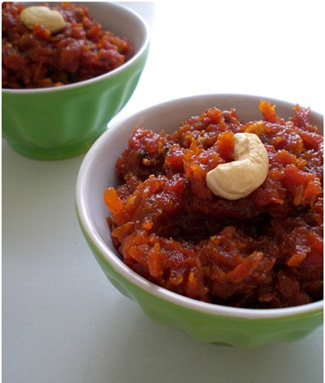 nice simple way of making gajar halwa.....thanx for this easy recipe. Assalamualikum Afreen. this recipe is delicious, every one at home liked it very much. thnx for sharing such a wonderful recipe with us. hope to see some more yummy n tasty recipes from u.
never thought it was so simple to prepare this delicious halwa. the recipe is fantastic.